The 3rd edition of ‘From youngsters in NZ to Kids in India” themed program, Ekal Rocks - 2011 was held on 2nd July 2011 at Hamilton Central Baptist Church, Hamilton, NZ. Young boys and girls from Hamilton had practiced hard and put out a fabulous show for the cause. Around 250 people came to enjoy the evening and rock on the tunes and dances. Everybody had gathered with one aim in mind – to make the education reach the under privileged children of rural and tribal India. Nandan Modak welcomed the guests and then handed over the reins to young Manasi Parulekar and Soham Rege, the master of ceremonies, for the evening. Prajakta and Alina both trained Bharat Natyam dancers composed their own dance on the Carnatic Fusion Mahaganapatim to start the show. The sweet little girls from Kalaniketan dance academy followed this, shaking their legs on Zoobie Doobie! 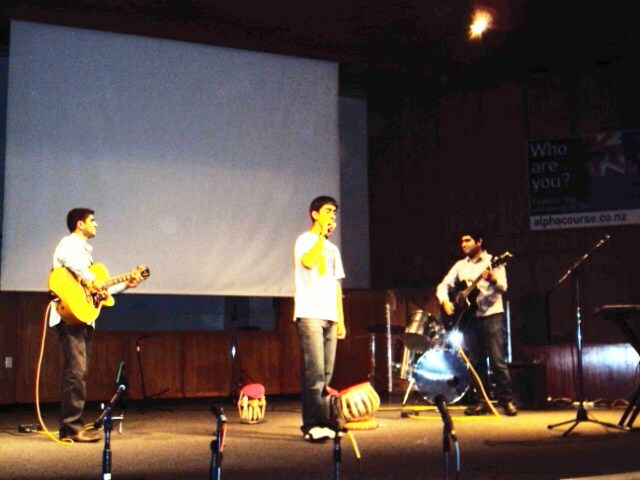 Then came budding talent of Sa Re Ga Ma School of Music with the Band Baaja and Baraat! telling ainvayi ainvayi lut gaya! followed by young Arjun singing Tu Jaane Na. The tabla ‘Gurus’ Pravasham and Sharanpal from Hamilton brought out a soothing Gazhal and budding composer Nachiket presented his own composition. After this, the program took a serious turn with Soham Rege giving an insight into the lives of deprived children in rural and tribal India and work Ekal Vidyalayas are doing in spreading education. The audience were impressed with the cause and also with the ability of such a massive organization to sustain its activities over a period of time mainly with contributions from volunteers all over the world. By this time the rocking group of budding artists had taken the stage with Nachiket on Guitar, Kunal on Keyboard/Guitar and Andrew on drums. Neel gave a rocking performance with Khwaab and Jay got people clapping with Shukrulla. Kunal changed the ‘Sur’ with Aabhi Jaa with Tuljai giving great support on the violin. Sanjay Joshi thanked everybody who contributed towards making this show a success and then Kunal and Nachiket presented the grand finale with Doori and Rock on, a fitting conclusion to Ekal Rocks 2011. We had huge support from appreciative Hamiltonians who braved the cold and wintry evening to come to show and there were no regrets, they loved every bit of evening performances. 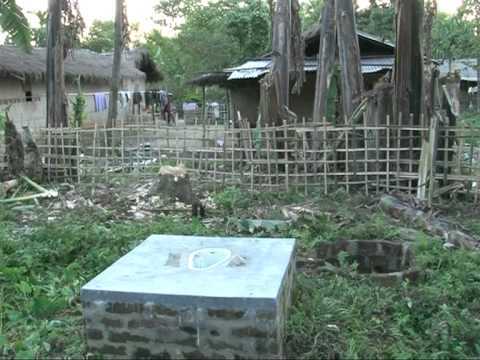 After listening to the presentations and watching Tanmoy Ghosh’s sort movie on Ekal many have shown interest in sponsoring a school for next year. In the meantime the food committee supported by the well wishers of Ekal were busy preparing hot meal for the guests. Everybody enjoyed spicy chole and garama garam aaloo wada with rice and suji Halwa for the dessert. Continuing with the spirit of volunteerism the food committee also picked-up the tab for the material, which probably saved enough money to sponsor a school. The idea was to make an effort and help education reach the underprivileged children of rural and tribal India. With efforts of the young boys and girls from Hamilton NZ, we should be able to sponsor 4 schools from the funds generated, which will bring education to 120 children in India so that these children can see their future in new light, full of hope and joy and we all believe every child deserves this. Ekal students celebrated Teachers Day on 5th September, 2011 on the birth anniversary of Dr. Sarvpalli Radha Krishnan at Kardhana village of Varanasi, Uttar Pradesh. On this occasion, 380 children of 10 schools of Kalikadham Sanch, Varanasi participated in the programme. Members from Sanch Samiti, Sankul Samiti, Anchal Samiti and Kshetra Samiti actively participated. Copies, Pens and Pencils were distributed by Mahindra Company to the students. The teachers were given cloths also. 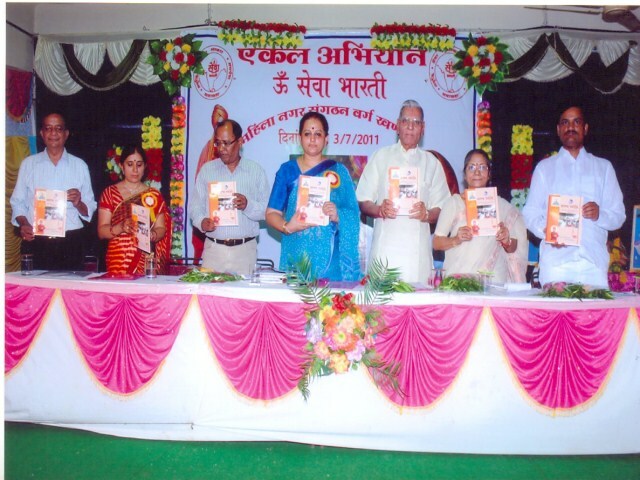 The 1st Mahila Nagar Sangathan Varg was held in Khandwa (Madhya Pradesh) from 2nd to 3rd July, 2011. Ladies from Anchals of Maharashtra, Madhya Pradesh and Gujarat participated in this Varg of West Zone. State Technical Education Minister, Smt. Archana Chitnis, the chief guest of inaugural ceremony, praised the women associated with Ekal Abhiyan. A total of 202 members participated in the varg. 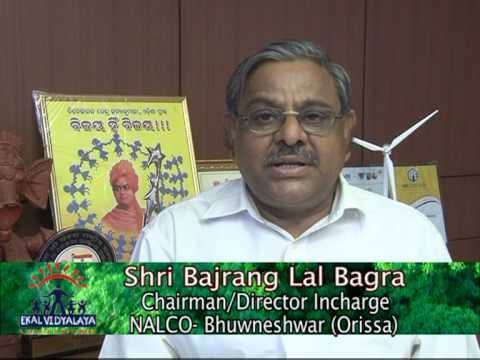 The 2nd Varg was held in Sambalpur (Orissa) on 16th to 17th July, 2011. In this varg of East Zone, women from Jharkhand, Bihar, Orissa, Bengal and Chhattisgarh actively participated. The aims and objective were discussed in the varg. The main speaker of this varg was Ma. Shyam Gupt. A total number of 132 participants were present in the varg. 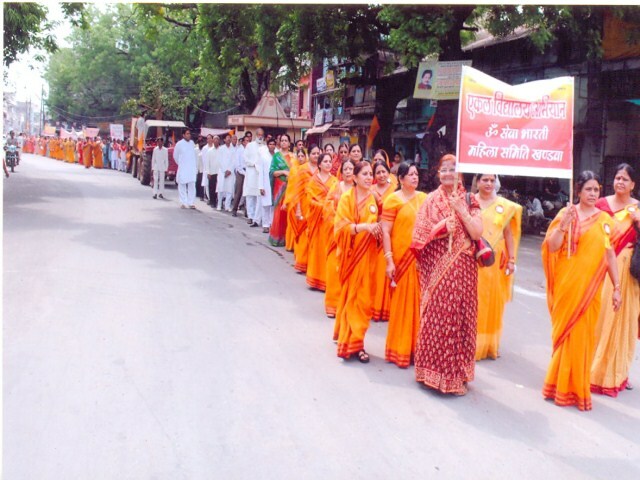 The 3rd Mahila Varg was organized in Varanasi (Uttar Pradesh). Participants from North Zone of India participated in the Varg. North Zone comprises J&K, Himachal, Punjab, Haryana, Rajasthan and Uttar Pradesh. Ma. Shyam Gupta was the main speaker. Dr. Annapurna Shukla, writer and Dr. Sumanlata Kedia, a famous history writer were the chief guest of opening ceremony. The participants took resolution to take Ekal Abhiyan to new heights. A total of 325 members participated in the meet. The 4th Varg was successfully held in Gangavati (Karnataka) on 6th to 7th Aug., 2011. The two days workshop was attended by Karnataka Anchal ladies. Mahila Samiti of Belgaum was present in full strength. The Inaugural function was graced by Shri Paranna Munavalli MLA and Smt. Lalitha Rani Shri Rangdevrayulu, President of Handicraft Eevelopment Board. A total number of 90 people participated in the workshop. Tremendous awakening among women volunteers of Ekal in North East was seen when the 5th Zonal Mahila Nagar Sangathan Varg was organized by Mahila Simiti of Friends of Tribals Society in Silchar, South Assam on 27th-28th Aug, 2011. On the morning of 27th Aug. 2011, the inaugural function of this North East Zone Mahila Varg was attended by local guests, chapter members and all the participants who arrived from different Anchals, Sankuls and Sanchs of North East. The inauguration took place with all mandatory norms. The chief guest Dr. Aparajita Chowdhary Ex-Director and Chief Examiner of North East University spoke about the glorious past of indian women participation in times of need. Under the leadership of Smt. Hemlata Singodia and young secretary smt. Vinita Khandelwal and patronship of Smt. Vimla Khandelwal all the ladies of Mahila Samiti marched ahead to make it grand success. A total number of 168 ladies participated in the Varg. 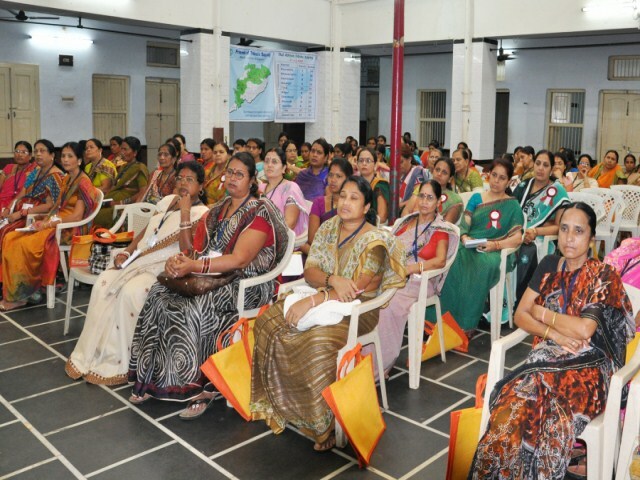 The 6th and last Mahila Nagar Sangathan Varg took place in Hyderabad (Andhra Pradesh) on 14th – 15th September 2011, the sixth and the last in the current year. Dr. K.Subrahmanium was the honorable speaker for the opening session. He quoted several examples from epics and history to prove the great role played by Mothers in moulding the society. The Mahila Varg was thoroughly conducted by Smt. P.Parijatha, Mahila sangathan Prabhari, A.P., Smt Neeta Bansal, President, Smt. Usha Mohan, Secretary and Smt manju Agarwal, Jt. Sec. of Janhitha Mahila Samiti. They jointly put all the efforts to make this event a great success. Sri Kailash Narayan Bhangaria, President and Shri Uday Khardekar Secretary of Janhitha (HYD, SVO) gave all the support and encouragement to Mahila Samiti. A total number of 102 participants participated in the camp. Arogya Foundation of India organized 8 health training camps in Banaras, Mughalsarai, Allahabad and Kaushambi of Uttar Pradesh, Udaipur and Sirohi of Rajasthan and Joginder Nagar & Palampur of Himachal Pradesh during 3rd Sept. to 25th Sept., 2011. Dr. H.K. Mittal, Smt. Sarita Mittal and Dr. Harish Anand from Delhi attended all these medical Camps and treated the patients. Besides this, the programmes like Health Awareness and Health Talk were also organized. Some people owed to leave addiction at many places. Around 5500 people benefitted in these health camps. The medicines were distributed at free of cost. 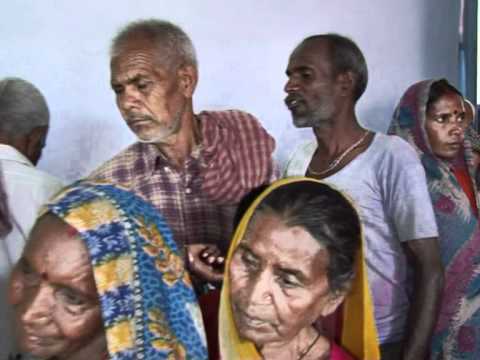 Patients suffering from the diseases like Anaemia, Malaria, Water Born Disease and Skin Disease etc. were cured. Some serious patients were also referred to the city hospitals. Samiti Members and fulltime workers of Ekal Vidyalaya participated enthusiastically in all the camps. Medicines and all other arrangements were made by local Ekal Vidyalaya Samitis. A total number of 45 Local doctors, 100 Samiti members and 100 fulltime workers of Ekal Vidyalaya contributed to make these camps successful. These health camps impacted very well in view of Organization. After the success of these camps, Arogya Foundation of India has decided to organize such camps yearly in every Sanch of Ekal Vidyalaya. The Friends of Tribals Society (FTS), Delhi Chapter, presented the film YOGI Vs BHOGI on 4th September. Produced by Ms Vandana Khaitan the film has a strong social message for the youth of today. Smt Kiran Bedi has given a guest appearance in the film and the hero of the film is Siddharth Mohan. Siddharth is a renowned Sufi Singer associated with Art of Living. The launch of the film was done in the jam-packed Sri Sathya Sai Auditorium on Lodhi Road. FTS Delhi Past President and Patron Sri Premji Goel was the Chief Guest and Dr Sama Maitri of Chinmay Mission’s CORD programme was Guest of Honor on the occasion. Sri Shyamji Gupta, praneta of Ekal Movement was the Chief Speaker. Sri Raj Kumar Karwa, President of FTS, Delhi welcomed the guests and Sri Vijay Maroo, Chairman North Zone, FTS, gave a presentation to let the audience know of what Ekal does. Sri Arun Rai, Secretary FTS proposed a vote of thanks. The film was very well appreciated by the audience and everyone was talking of how nicely the youth has been given the social message regarding female feticide, corruption and aids. Vandana Khaitan said that the aim of the film is to fight social evils through spiritual awakening. Some businessmen and industrialists, while appreciating the efforts, said they would like this film to be used as their corporate gift during the oncoming festive season. On August 2nd, 2011, I along with my family and Sri Sudhir Shetty (FTS, Bangalore) visited an Ekal School in Kaullige village of Mysore Anchal in Karnataka State. As I am new to Ekal organization, visiting the school was a great learning experience. I am simply amazed how efficiently the school is being run with just Rs.16,000 donation per year. I learnt that the Acharyas from the cluster of 90 villages gather every month and share their experiences and set the curriculum for next month. I happened to be at one of those gatherings and took the Sankul picture. I felt that the Acharyas are young and well disciplined. This Sankul gathering took place at Hunsur which is about 35km from Mysore. Next, we visited the school at the Kaullige village which is about 25km from Hunsur. We were warmly greeted by the school kids. When we entered the class room we saw about 30 kids smiling and greeting us. Those kids performed several programs such as songs, dance and yoga. We were amazed at their qualities. I was particularly impressed by the yoga that a girl performed. I have attached the pictures of the class and the yoga. Overall, this was a great experience for me and my family as well. I would like to thank Dr. Satheesh Kumar and Sri Sudhir Shetty for organizing this visit. Sri Vinay Venkataraman and Smt. Priya Mani from Copenhagen Institute of Interaction Design, Denmark visited Ekal Vidyalayas in Ooty Anchal on 11th September 2011. 3 schools were visited in the villages of Subramaniyapuram, Mainyada & Sakthi Nagar. 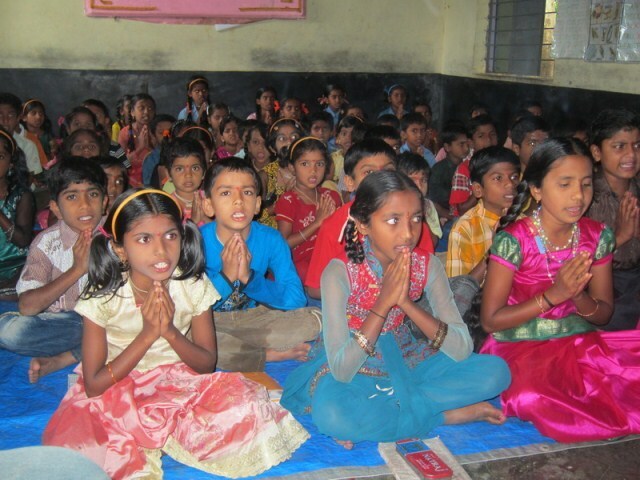 In the first school, they observed and understood the concept of Ekal Schools. It was a part of their research work to understand the rural and tribal educational situations and to provide appropriate cost effective teaching aids for better performances. Later they explained about their project and had interaction with the students, teachers and full time workers. This visit was arranged by Dr. P.R. Krishna Kumar, Patron, FTS Coimbatore Chapter. The visitors were accompanied by Kum. Lalitha, Anchal Abhiyan Pramukh, Sri Mynthan, Sanch Pramukh and Sri Boopalan, Saha Sanch Pramukh to organize and understand the system of Ekal Vidyalaya Movement. 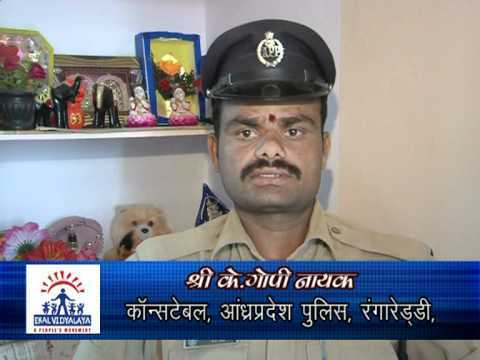 Mr. Vinayak said, ‘Thanks a lot for showing Ekal schools. It was a very inspiring experience. I hope we will come back with new ideas sometime soon’. I along with with my husband had an everlasting experience of visiting 4 Ekal schools in the Kashmir valley and attended Baramulla Sanch Sammelan on 27th and 28th Sept. 2011. To our utmost joy, all the full timers, teachers and students are Muslim and all of them are well educated. We had the opportunity of having tea, apples and snacks at our full timer's home. The schools are running well, on time. Students informed that due to Ekal Vidyalaya they are able to recite their Aayat nicely, learned to give respect to their elders, learned to enact plays etc..
Sanch Sammelan was held at Kunsar valley, which is at the foothills of Gulmarg. It was attended by 30 teachers along with 4 students each of the respective schools. A new Sanch is being made there, around 10 teachers of the new Sanch, some enthusiastic parents of the Baramulla Sanch along with full timers of that area were present. The Municipal Co-operator of that area also attended the programme and praised the work done by ekal movement. He was overwhelmed that people had come from Delhi to attend the function. The programme started with a song praising our motherland. Subsequently, the students started their programme with poems, songs, plays, dance, Aayat etc.. Our hearts were filled seeing their confidence and enthusiasm. Tears rolled down seeing their talents. Why I had not visited them earlier? I congratulated the teachers for their efforts, for bringing out the talents in the students. I was gifted a Kashmiri stole made by our Upsanch Pramukh. I bow down to the Co-ordinator Sri Jaidev Ji for inviting us to the Valley.